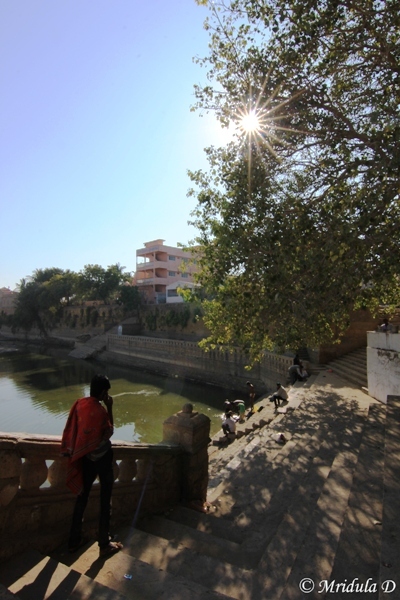 After spending about half a day at Lakhpat, my next stops in the day were Narayan Sarovar, Koteshwar. I was told that Narayan Sarovar has a religious significance and otherwise not much of a place. But as it is quite close to Lakhpat (35 km) I decided to check it out. 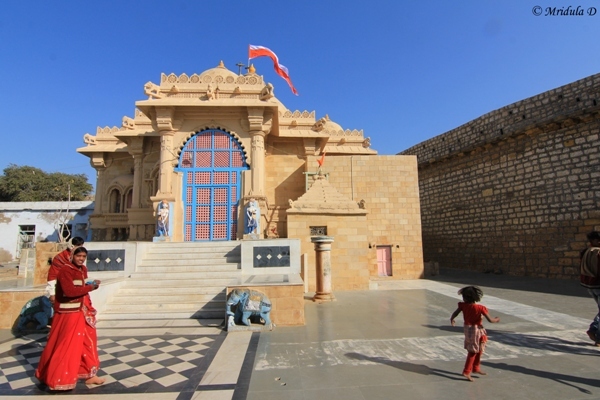 At the other end of Narayan Sarovar is Koteshwar (2.1 km) which has a temple by the sea. This temple is said to be the westernmost point of India. After Lakhpat I was desperately looking for tea which I found at Narayan Sarovar. In Gujarat at dhabas people drink tea from the saucer rather than the cup. But I would need to spend more time before I made an attempt, I restricted myself to drinking from the cup. It was nice tea, not too sweet. As told to me there was not much water in Narayan Sarovar. I could see plastic bags floating on the sarovar. The water didn’t look clean. But then faith is another thing! To the devoted it has healing properties and people were taking a dip in the sarovar. There is a temple at the sarovar but I am told it is the sarovar that is of greater religious significance. The temple complex was full of colors. I was here at noon so I was struggling to click pictures as the sun was harsh. 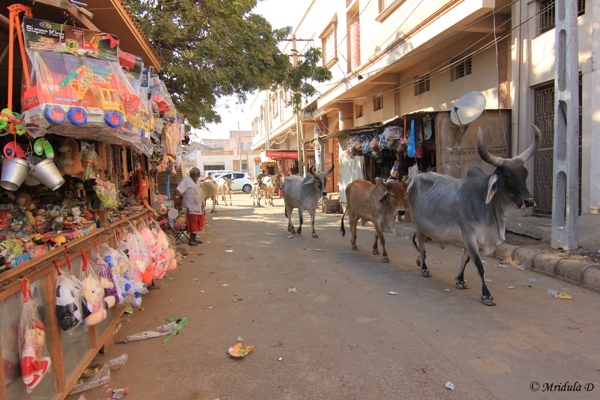 There are a few shops outside that sell random souvenirs and parsad. The place has a dusty look which somehow adds to the atmosphere. It was not too crowded when I visited it. As Narayan Sarovar to Koteshwar is just 2 km I was at Koteshwar within no time. The legend associates this temple with Ramayan. Apparently it was at this place Ravan kept the Shivling down when he was not supposed to. The idol multiplied and he could not figure out the original one ever again. After a quick visit to the temple, I ran to the sea. At both the temples no one hassled me to perform any pooja. 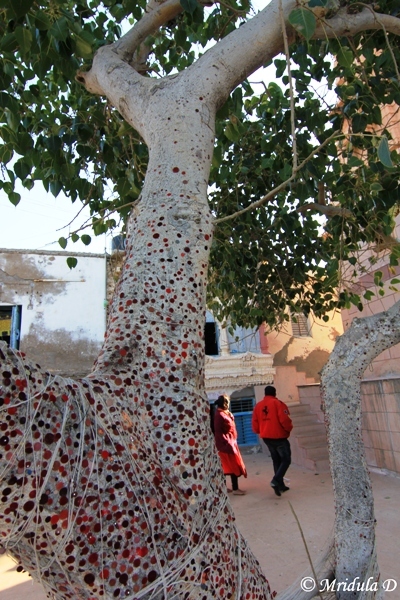 While I was running towards the sea I saw this tree where women would put a bindi on the trunk. I asked a few ladies for the reason but they had no clue why it was done. I was not wearing a bindi or I too would have pasted it on the tree! The sun was still quite high, the sunset at least an hour and half away. I wanted to stay but Devpur is 115 km from Koteshwar. I was traveling solo as well. 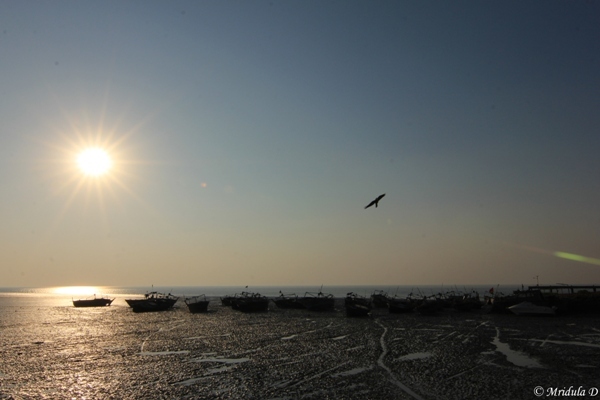 I decided to miss the sunset as I would it catch it at Mandvi. Koteshwar is said to be the westernmost point in India. The temple is situated on a high plinth overlooking the sea. 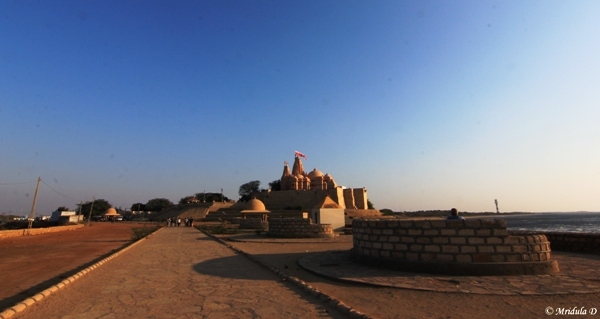 Koteshwar Temple is the last outpost of human construction at the westernmost limit of India, is the breaking point of the skyline from the flat brown horizon to the east and the wide blue horizon to the west. From this point, the glow of light from Karachi, Pakistan can be seen in a clear night. It is an excellent sunset point. We had a car breakdown while going, a new Maruti Swift too which was quite surprising. They managed to find an Alto from the village where the breakdown happened. 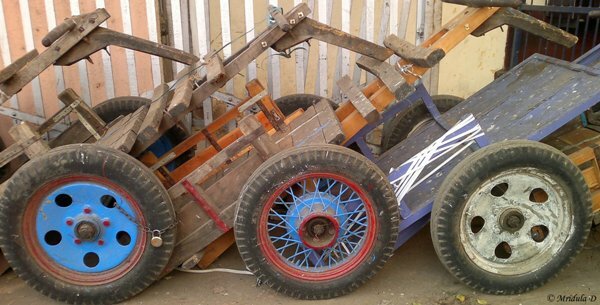 We changed the cars again at the village and I reached Devpur without any further incidents. It was a good first day. It is not that I seek out to travel solo but solo trips just happen. Like first I thought I was going to Bhutan with my younger nephew but that didn’t happen. 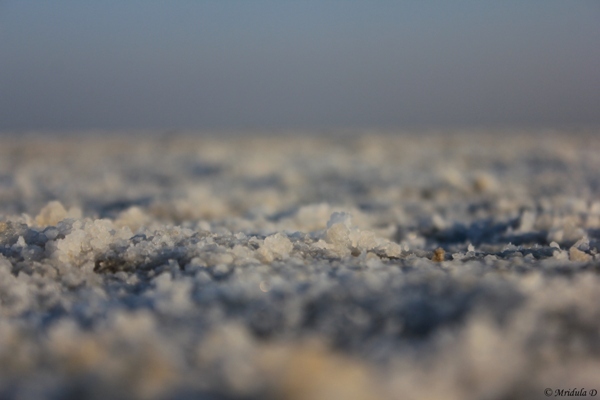 In the end the first trip of 2014 was to Kutch, my personal vacation and solo. I will recount conversations that happened because of traveling solo. Man: Are you a journalist? Me: No I am not. Man: With that camera I thought you were! Boy: Ma’am where are you from? Boy: Well you must be working there cause I can recognize a Haryanvi when I see one. The officer was asking if you are a foreigner! I told him she is traveling alone but she is from Delhi and speaks Hindi. Woman: Are you a scientist? Woman: Well you are sitting on the ground and clicking pictures so I thought you must be conducting research. So much so for trying for another angle for a photograph! A stranger: Ma’am which country you are from? Me: मैं भारत से हूँ और हिन्दी में बोलते हैं. (I am from India and I speak in Hindi). Boys: Can we take your camera and pose with it? Me: Yes and if you wish you can take pictures with it. Boys: No ma’am we are happy posing. All Because of a Tripod! Girl: Are you a professional photographer? Me: No I like clicking pictures but I am not a professional. Girl: Points to the tripod and says- well with all this I thought you must be but you say you are not! Woman: Yes you will enjoy particularly if you are a loner! Me: Scratching my head and thinking if I am a loner, I guess I am a bit of. 10. 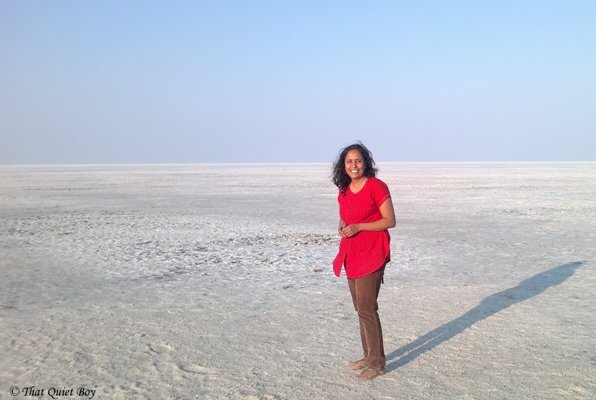 And for a change me to a boy at Great Rann of Kutch, he was the quietest boy around, was on cell phone for a while before, I guess with his girlftriend. Me: Will you click a picture for mine. I give him my cell phone and stand. People were a bit curious about me traveling solo but it was mostly fun. I never once was hassled. 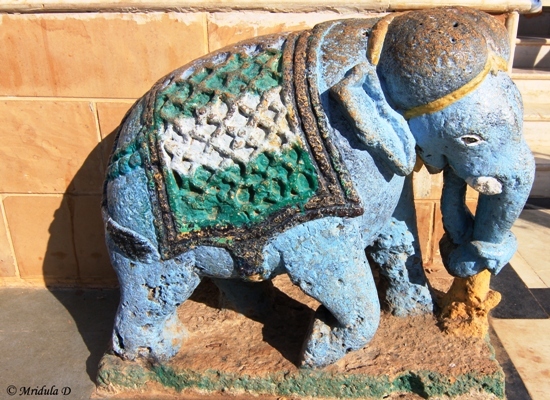 I saw some eye catching colors in Kutch, Gujarat. The first frame that made my eyes pop out was at Narayan Sarovar which is quite close to Lakhpat. 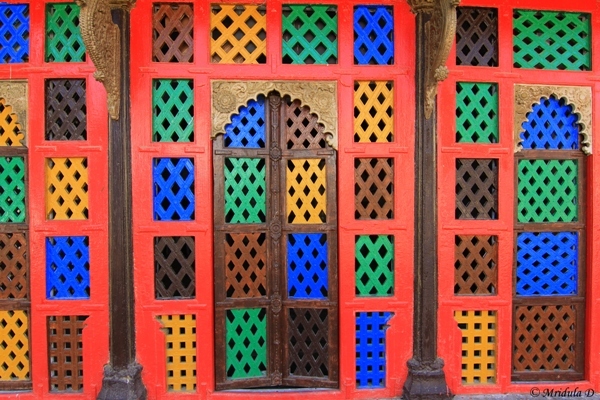 These colorful jalis were part of the complex of the temple at the Narayan Sarovar. It made me conscious that I should try and capture the colors of Gujarat. The sarovar in itself is in urgent need of cleaning up. I would say if you are not too particular about its religious significance you could give it a miss altogether. But then it is quite close to Lakhpat. so you might as well do it! Then there was this colorful ceiling at the temple complex at Narayan Sarovar. There are three such colorful displays inside the temple, all equally eye catching. Whoever must be using these carts must be doing heavy work. 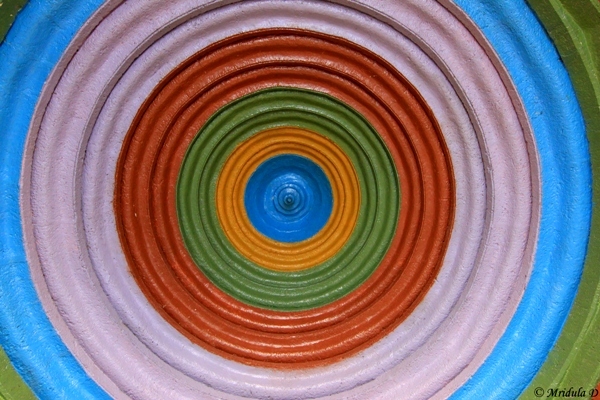 And yet there was such a display of colors on the wheel. They were stacked up right at the Ahmedabad Railway Station. This one is a cell phone picture. I am not a big shopper generally but I did go berserk at Kutch. The clothes were so colorful that I had to buy a lot of stuff! 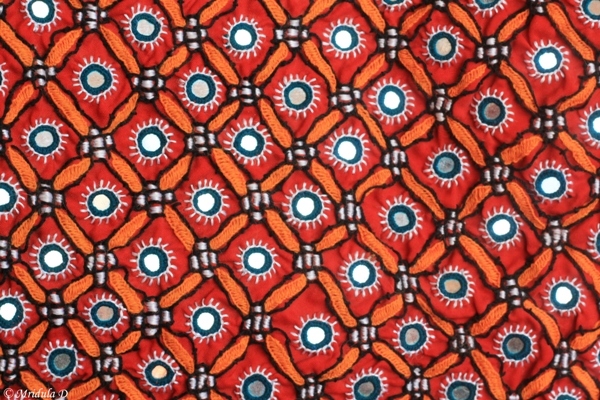 Their shawls, dress material, handbags and a lot more. 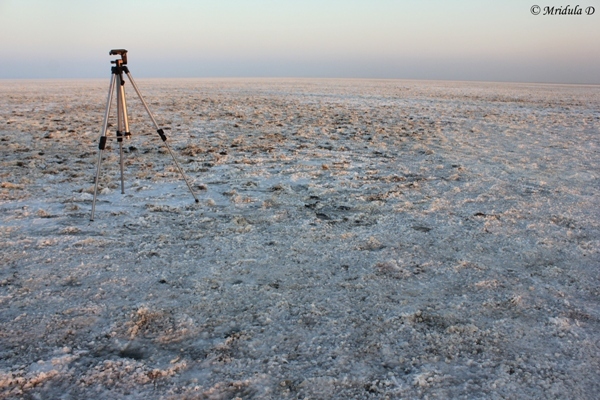 Finally there is the Rann of Kutch, all white as far as the eyes could see. The Rann Utsav of Gujarat Tourism was in full swing. There us a paved road leading to the Rann. At the end of it there were these musicians in their colorful head gears and shawls. 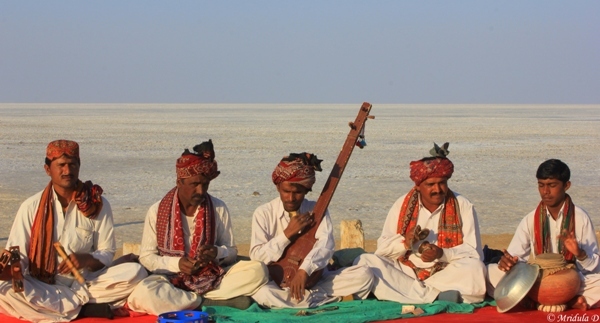 It was quite an experience to enjoy the Rann along with their music. So which is your favorite color out of these?